2017/12/1 Started Ph.D. @ CSH. 2017/11/27 Successfully defended master thesis. Popper and McCloskey. Logic or Rhetoric of Science? It has recently been argued that a non-Bayesian probabilistic version of inference to the best explanation (IBE*) has a number of advantages over Bayesian conditionalization (Douven ; Douven and Wenmackers ). We investigate how IBE* could be generalized to uncertain evidential situations and formulate a novel updating rule IBE**. 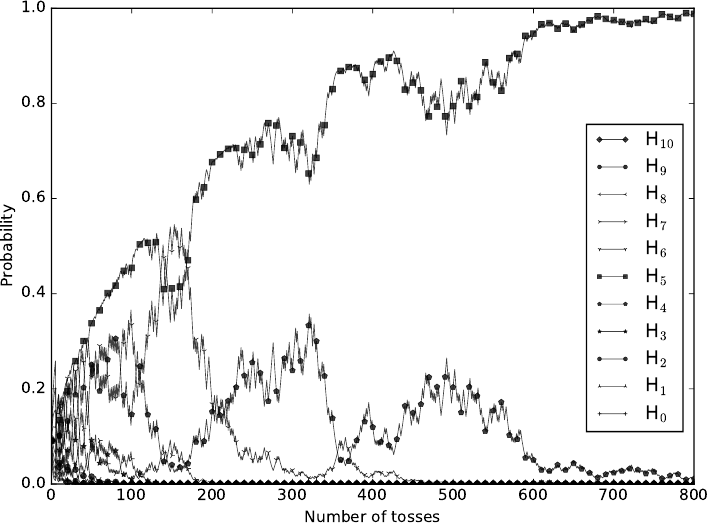 We then inspect how it performs in comparison to its Bayesian counterpart, Jeffrey conditionalization (JC), in a number of simulations where two agents, each updating by IBE** and JC, respectively, try to detect the bias of a coin while they are only partially certain what side the coin landed on. We show that IBE** more often prescribes high probability to the actual bias than JC. We also show that this happens considerably faster, that IBE** passes higher thresholds for high probability, and that it in general leads to more accurate probability distributions than JC. Douven, I. : ‘Inference to the Best Explanation, Dutch Books, and Inaccuracy Minimisation’, Philosophical Quarterly, 63(252), pp. 428–44. Douven, I. and Wenmackers, S. : ‘Inference to the Best Explanation versus Bayes’s Rule in a Social Setting’, The British Journal for the Philosophy of Science, 68(2), pp. 535–70. Pellert, M. (2017). 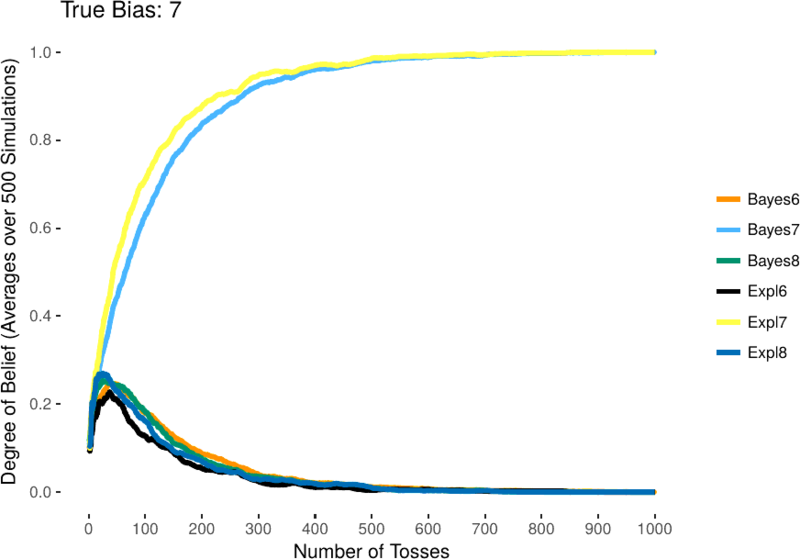 Collective Dynamics of Multi-Agent Networks: Simulation Studies in Probabilistic Reasoning. In P. Hochenauer, C. Schreiber, K. Rötzer, & E. Zimmermann (Eds. ), Proceedings of the MEi: CogSci Conference 2017. Budapest, Hungary: Comenius University in Bratislava, Slovakia. Agent-based modelling is seen as an alternative to traditional, “equation-based” modelling. It has seen applications in diverse areas. At the same time, the modern formulation of network theory became part of science, influencing discipline after discipline. Historically, however, networks have almost exclusively been dealt with implicitly by agent-based modellers. Their “network awareness” is a very recent phenomenon . Belief updating refers to the process that enables an agent to alter his belief in a given hypothesis conditional on evidence that it receives. This concept is part of the field of “formal epistemology” that explores knowledge and reasoning using tools from math and logic. Bayesian approaches to probabilistic reasoning are dominant here. Proponents uphold that Bayesianism is the only rational way of belief formation, given that no other strategy protects an agent in principle from “Dutch books” (bets that guarantee a loss to one side). Nonetheless, alternatives that are probabilistic but not (Standard-)Bayesian have been introduced under the heading of “Inference to the Best Explanation”. The use of alternatives is justified by questioning the practical relevance of Dutch book arguments and by resorting to pragmatism: It has been shown that there are strategies that have speed and accuracy advantages in belief updating . This thesis will explore different scenarios with multiple agents updating their beliefs and influencing each other through specific network structures. The dynamics on networks as well as the dynamics of networks will therefore be in the focus of analysis . Agent behavior and network dynamics develop interdependently, i.e. they coevolve. Apart from being a methodological advance, it is expected that this approach can yield novel theoretical insights on the dynamical formation of network structures by interacting agents. 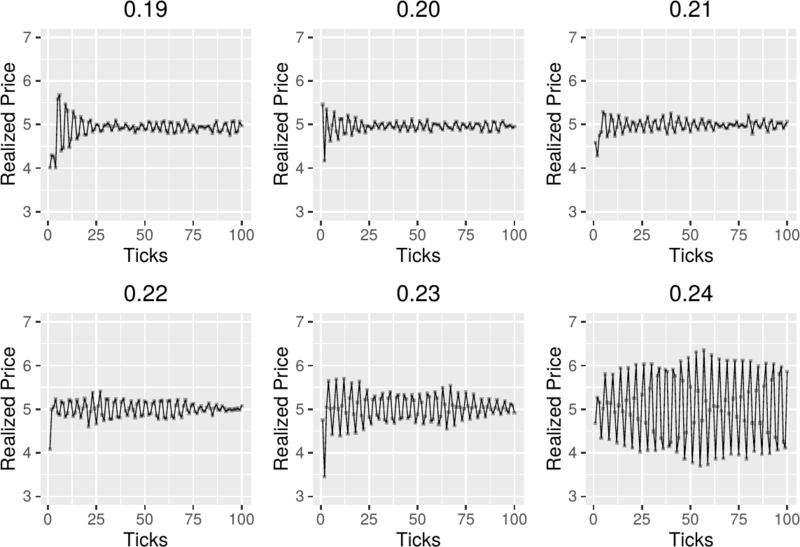 Additionally, it will be possible to demonstrate that there are alternatives to Bayesian updating that also yield advantages in multi-agent settings. On a meta-theoretical level it will be argued that simulation results can be treated as quasi-empirical. Several necessary conditions will be identified that need to be fulfilled for this aim. We borrow methods from computer science to investigate questions from philosophy (of science). Additionally, work done in the social sciences on agents and networks will provide input. M. Newman, Networks: An Introduction. New York, NY, USA: Oxford University Press, Inc., 2010. I. Douven and S. Wenmackers, “Inference to the Best Explanation versus Bayes’s Rule in a Social Setting,” The British Journal for the Philosophy of Science, 2015. A. Namatame and S.-H. Chen, Agent-Based Modeling and Network Dynamics. Oxford, New York: Oxford University Press, p.10, 2016. Are Heterogeneous Expectations a Viable Alternative to Rational Expectations in Economics? Pellert, M. (2016). Are Heterogeneous Expectations a Viable Alternative to Rational Expectations in Economics? In S. Ersoy, P. Hochenauer, & C. Schreiber (Eds. ), Proceedings of the MEi: CogSci Conference 2016. Vienna, Austria: Comenius University in Bratislava, Slovakia. Expectations play a crucial role in economic theories. Different ways of modelling and parameterising expectations change outcomes massively in (macro-)economic models. On a meta-theoretical level, some authors even go as far as to claim that: “Individual expectations about future aggregate outcomes are the key feature that distinguishes social sciences and economics from the natural sciences” . The prevailing expectation hypothesis used in economics is that of “rational expectations” (RE) . Here, it is assumed that expectations are nothing more than the predictions of the relevant theory, i.e., they are defined to be model-consistent. Furthermore, it is assumed that people make no systematic mistakes. Finally, modellers typically introduce “representative agents” (e.g., “the average household”) equipped with RE to bridge the gap between micro- and macro-levels; all interacting units of the economy are therefore alike. Over time, it became more and more evident that certain real-world phenomena, like the global financial crisis, are very hard to fit in a uniform RE framework. Expectations modelling in economic theory thus is in need of theoretical innovation. New proposals ought to have a strong interdisciplinary foundation, reconciling valuable insights from several other disciplines, including sociology, psychology and anthropology. In particular, we take interdisciplinary thinking to be an effective remedy against the harmful tendency of a large part of economics to isolate specific aspects of human behaviour and then to treat these and only these as “purely” economic subject matter, as in the case of RE. The concept of “heterogeneous expectations” has been suggested as an alternative to RE, instantiated in so-called “agent-based models” . Here, heterogeneous agents use different methods of expectation formation. The “wilderness” of this approach is fenced in e.g. by the use of genetic algorithms that describe agents' switching between heuristics according to a fitness criterion, e.g. accuracy of prediction. The goal of our project is to give a critical assessment of rewarding ends and eventual dead ends in the theoretical development of agent-based economic modelling with heterogeneous expectations. The outcome of this work should be a stepping stone towards a more outward-looking theory of dynamics in (financial) markets. Special thanks to Paolo Petta and OFAI for supporting this project. C. Hommes, “The heterogeneous expectations hypothesis: Some evidence from the lab,” Journal of Economic Dynamics and Control, vol. 35, no. 1, 2011, pp.1. J. F. Muth, “Rational Expectations and the Theory of Price Movements,” Econometrica, vol. 29, no. 3, pp. 315–335, 1961. D. Delli Gatti, S. Desiderio, E. Gaffeo, P. Cirillo and M. Gallegati, Macroeconomics from the Bottom-up. Milan, Italy: Springer Italia, 2011.